Vitamin A is the only known molecule that keeps the skin healthy and helps to provide anti-aging benefits. The most common skin care problem in both men and women is sun-damage, and the long-term effect of sun exposure are sinister. In order for us to combat this sun-induced vitamin-A deficiency, we must topically replenish vitamin A in our cells every day and for this process to be effective, we need to restore our vitamin A receptors. Most of your vitamin A intake comes from eating foods rich in Beta Carotene, which is found primarily in foods including sweet potatoes, carrots, dark leafy greens, winter squashes, lettuce, dried apricots, cantaloupe, bell peppers, fish, liver, and tropical fruits. Plants need to be converted to active vitamin A in order to be utilized by the body. Not only do these protect against free radicals that break down collagen and contribute to fine lines and saggy skin, they also lessen skin’s sensitivity to the sun, providing some natural protection against sun-induced redness and pigmentation. Vitamin A has been scientifically proven to help rehabilitate, regenerate and restore the appearance of unhealthy skin. These Vitamin STEP-UP SYSTEMS moisturizers gradually introduce skin to increased levels of vitamins A, helping to replenish the effects of your skin’s natural vitamin A levels. 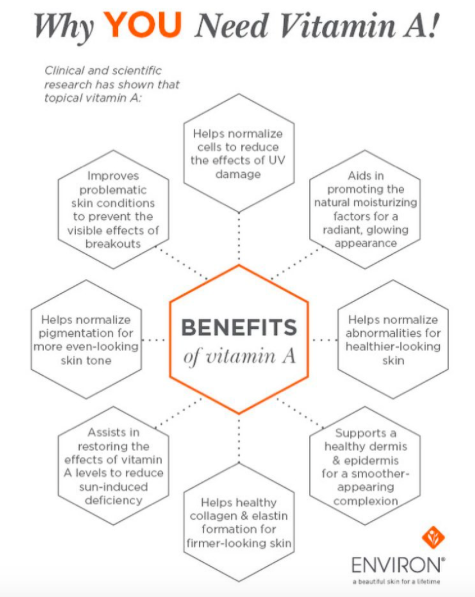 Vitamin A is the cornerstone ingredient in the Environ Skin Care philosophy and must be replaced daily for skin to appear healthier and more radiant. Combined with other essential ingredients, like antioxidant and peptides, the long-term enhancement of skin’s appearance becomes clearly visible. It protects against UV damage and slows signs of aging. 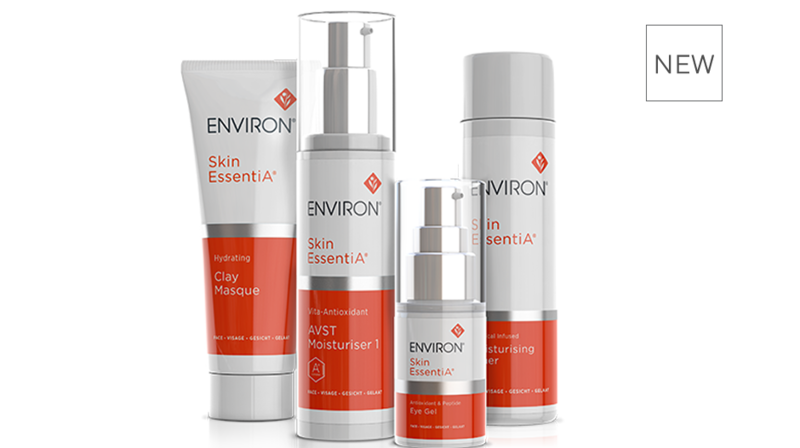 By committing to Environ Skin EssentiA, Youth EssentiA or Body Range you will see immediate results. A powerful combination of vitamins and other essential nutrients in the new Skin EssentiA Range helps to replace the effects of what skin has lost by delivering optimal levels of vitamin A, helping to restore the results of skin’s natural vitamin A levels and to reveal its natural beauty. Environ complete range of products available at Renew Anti-Aging Center. Book a free 15-minute consultation to learn how Environ products can change your life.